Adopted when Jamaica withdrew from the Federation of the West Indies on August 6, 1962, the flag of Jamaica represents a strong new nation. The Jamaican national flag features green, black, and gold, all common colors in African cultures and seen on various African flags, reflecting the country's African heritage. The green symbolizes hope, agricultural richness, and vegetation. Black has represented hardships as well as strength for overcoming those hardships, and gold is for the sun shining on Jamaica. After gaining independence from the British West Indies in 1962, Jamaica launched a national competition to find the design for their new national flag. 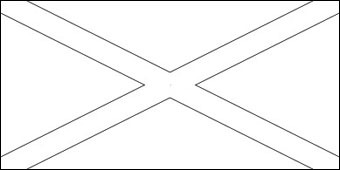 Of many designs submitted, the gold saltire, or X, beat out various striped flags in the same color scheme.